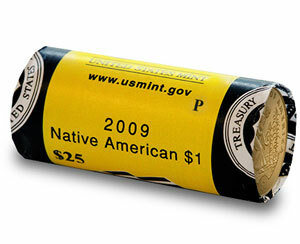 A popular method of collecting Native American Dollars is by the roll. Collectors can seek to acquire one 25-coin roll of uncirculated coins for each year of the program. In most cases, rolls acquired during the original year of issue can be purchased for only a modest premium to face value. Thus far, the primary point of distribution for newly issued circulation strike Native American Dollars has been the United States Mint. From 2009 to 2011, the coins were available through the Mint’s Direct Ship Program at face value. For all years of the program, the coins have been available within numismatic rolls, bags, and boxes within special packaging and priced at a premium to face value. The Direct Ship Program was intended as a method for businesses or individuals to order dollar coins in quantity with the intention of introducing the coins into circulation. Boxes containing 250 coins could be purchased at face value with no additional charges for shipping and handling. The coins were packaged in standard coin wrappers without identification of mint mark. The program was a temporary boon for collectors as a source of Native American Dollars at face value. Unfortunately, the program was canceled due to widespread abuse. The numismatic rolls, bags, and boxes have been offered specifically as collector products. For each year of the program specially wrapped 25-coin rolls have been issued. For certain years, 100-coin bags, 250-coin boxes, and 500-coin boxes have also been offered. These products are priced at a small premium to face value. The packaging for each product carries United States Mint branding as well as an indication of the year, mint mark, and face value of the contents. Typically, the numismatic offerings are available during the original year of issue and often extending into the following year. Once the products are sold out at the United States Mint, the secondary market becomes the primary source for collectors seeking older dated rolls. Generally, there will be sellers or dealers who will keep uncirculated rolls of the coins in stock and sell them for a premium. Over time, the lower mintage dates tend to generate stronger premiums than the higher mintage dates.